We’d love your help. 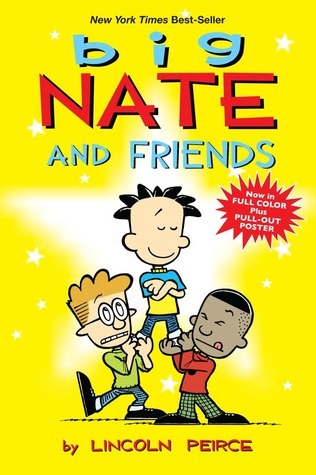 Let us know what’s wrong with this preview of Big Nate and Friends by Lincoln Peirce. Sixth-grader Nate Wright is on top of the world . . . with a little help from his friends! His best buddies, Francis and Teddy, stick with Nate through thick and thin—usually thin. They've seen it all. Nate's disastrous love life, his ch Join Nate in this collection of his funniest moments, as he confronts the pressures and concerns of sixth grade with his classic hilarity. Sixth-grader Nate Wright is on top of the world . . . with a little help from his friends! His best buddies, Francis and Teddy, stick with Nate through thick and thin—usually thin. They've seen it all. Nate's disastrous love life, his chess tournament trash talking, even his misguided attempt to be a "bad boy." Along the way, Nate and his pals are joined by Artur, the gentle exchange student who's popular with almost everyone. And don't forget Gina, the teacher's pet who gets an "A" for annoying. They're all here in this collection of cartoons, featuring highlights from Nate's most hilarious adventures. To ask other readers questions about Big Nate and Friends, please sign up. what is the most exciting experience did nate have in this book? This review has been hidden because it contains spoilers. To view it, click here. This is my fifth time reading this book and this is a great book heres why. I think this is a great book because its funny and it was very well written. Why I rated it five stares. I rated it five stares because I love comics and because theres funny jokes like Hi butthead! says francis Hi ugly says! Nate Hi pizza face! says Francis Hi pencil neck! says Nate Hi fish breath! says Francis Hi pea brain! says Nate Hi geek boy! says francis and so on. I think the Big Nate books are very interesting and fun to read if you like the diary of a wimpy kid books you will like this book,join Nate and his crazy friends in middle school. Sixth-grader Nate Wright is on top of the world . . . with a little help from his friends! His best buddies, Francis and Teddy, stick with Nate through thick and thin—usually thin. They've seen it all. Nate's disastrous love life, his chess tournament trash talking, even his misguided attempt to be a "bad boy." 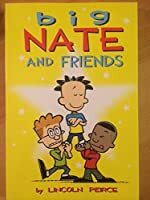 Along the way, Nate and his pals are joined by Ar Join Nate in this collection of his funniest moments, as he confronts the pressures and concerns of sixth grade with his classic hilarity. The book Big Nate And Friendswas a good book. Nate Wright is a 6th grader who is always getting into mischief. Between him and his two friends Teddy and Francis they have a good time a lot and pick on each other all the time. Francis is the smart friend of his who doesn’t like to take risk like Nate and Teddy. Also there is Gina who is the all “A” student and is a teacher’s pet and is always wanting to get Nate in trouble. Then there is Artur the foreign exchange student who is better at everythi The book B​ig Nate And Friends​was a good book. Nate Wright is a 6th grader who is always getting into mischief. Between him and his two friends Teddy and Francis they have a good time a lot and pick on each other all the time. Francis is the smart friend of his who doesn’t like to take risk like Nate and Teddy. Also there is Gina who is the all “A” student and is a teacher’s pet and is always wanting to get Nate in trouble. Then there is Artur the foreign exchange student who is better at everything than Nate. Nate is very jealous of Artur because he got the girl who Nate likes. Not to mention he is popular. I really like this book and for anybody that has a good sense of humor I recommend this book. It made me laugh because it was funny. There were many surprises in this book. It may be a tweens book but I liked it. I found this book's set up hard to read because I'm not really into comics. I find it easier to read when it's the traditional reading horizontally left to right. I don't want to critique if people prefer reading graphic novels. What I liked about this book was that it showed that if you pick the right friends, then they will be by your side through thick and thin. Before I opened the book, I didnt expect for the illustrations to be in all black and white because the cover was in full color. The I found this book's set up hard to read because I'm not really into comics. I find it easier to read when it's the traditional reading horizontally left to right. I don't want to critique if people prefer reading graphic novels. A poor imitation of Calvin and Hobbes. Get the real thing, skip this. This book was the most epic waste of my time. First of all, it was really boring, every time I flipped a page of that horrid book I felt my life dragging by every second. Second of all, it was stupid. Like Nate trying to be better than his friends absolutely stupid. Last of all, no voice at all. This book was awesome! I slight summary of a main event is this. Nate is with his best friend Teddy when he sees a "Sold" sign in front of their hated teacher, Mrs Godfrey's house. The immediately start celebrating that they will never have to see their evil teacher again. They walk into school the next day saying everything seems brighter and happier, and they can't wait to go to class without Mrs Godfrey. When they finally walk into their classroom they are hugely surprised! See what happens i This book was awesome! I slight summary of a main event is this. Nate is with his best friend Teddy when he sees a "Sold" sign in front of their hated teacher, Mrs Godfrey's house. The immediately start celebrating that they will never have to see their evil teacher again. They walk into school the next day saying everything seems brighter and happier, and they can't wait to go to class without Mrs Godfrey. When they finally walk into their classroom they are hugely surprised! See what happens in this awesome book! Nate is the main character in this book along with his best friends Teddy and Francis. Nate has never had a grade better than a B, and can't stand one one thing about it. Francis is the total opposite with perfect grades, super tidy, and yet they are still best friends. Then there is Teddy; he's about right in the middle with it all. Nate starts pretty shallow, as his friends say. Will he humble himself or continue to be "self-worshipping". The book was about Nate and his friends they had a party at school and they had fun during the winter break. I liked this book because it was very interesting for me, the pictures had lots of details and color and also because the characters were saying their words like if they were right here talking to me. I would recommend this book to my 2nd-grade cousin because he likes to read these kind of books that have lots of pictures. This book is about Big Nate. Big Nate likes to play basketball. He goes to play a basketball game against another school and they win. I like this book because it's fun to read about basketball. I would recommend this book to Jordan because he likes Big Nate books. Big Nate and Friends is a great book to read over the summer or have any free time. The book is all about a boy named Nate (of course) and he thinks every thing is all about him. his best friends are Francis & Teddy they are all in the same classes ever since preschool. This was a really good book. I could like know what he was feeling because I went though it already. I like this book so much I started reading the other book. Another set of awesome comic strips by Lincoln Pierce! This book is really really really funny! really good i loved it. from first page the page i knew i would love it. I finished the book 10 days before i started it. Man, I haven’t read comic strips like this since I was like 14. What a nostalgic feeling. The jokes are still cute and witty even with this character I wasn’t familiar with prior to randomly picking it from the library. I knew it was a popular series, but that’s about it. Nate is a typical self-absorbed kid with a touch of ADHD. He has good friends who give him an equal amount of crap as he gives them. The females in his life also give him crap, so his selfishness is addressed, which is refreshi Man, I haven’t read comic strips like this since I was like 14. What a nostalgic feeling. The jokes are still cute and witty even with this character I wasn’t familiar with prior to randomly picking it from the library. I knew it was a popular series, but that’s about it. What I like about the beginning is how Nate does things to people and then the other people will come back and hurt Nate doing something similar. The middle's best part was when he got beat up by a girl. The ending's best part was when he sent a letter to a famous girl and when he did that other girls were curious to what he had said. The best part about the whole story is that they are still in 5th grade even after 2 years. This wants to be Calvin and Hobbs, but it happens without any of the self-awareness, social commentary, subtle humor, or big-heartedness. It’s more potty humor with a kid who is just jealous and lazy, with the occasional joke that edges a little toward the raunchy or cruel side. Still, I think I get why this is popular. It does a decent job with the awkwardness and embarrassment and self-exploration that happens in middle school. i enjoy this series. i think kids will too. hopefully they get the sarcasm and see what a petty little thing Nate is. this one does focus a lot on his relationships with his friends rather than his family and teachers. the prank day section had a lot of potential and i wish they played it out more. How big Mate was good. This book is really funny because when Mrs. Goodfrey tells Nate to sit up, Francis gives him a wedgie. Nate, he freaks out when during the summer he doesn't want to do math but he ends up doing math when he's trying to find out if he has enough to buy everything. Lincoln Peirce is a cartoon artist from Portland, Maine. He lives with his wife and two children, and occasionally gives lectures to students about cartoon creating. Peirce writes the comic strip "Big Nate". Peirce's comic strip, Big Nate, is featured as an island on the famous children's website, Poptropica. Big Nate appears as the first cartoon on The Maine Sunday Telegram in the comics section. Lincoln Peirce is a cartoon artist from Portland, Maine. He lives with his wife and two children, and occasionally gives lectures to students about cartoon creating. Peirce writes the comic strip "Big Nate". Peirce's comic strip, Big Nate, is featured as an island on the famous children's website, Poptropica. Big Nate appears as the first cartoon on The Maine Sunday Telegram in the comics section.